The fan draws moist air into the machine and passes through the heat exchanger. At this moment, the moisture in the air is condensed into water droplets, and the treated dry air is discharged out of the machine. Such circulation reduces the humidity in the room. 1. The dehumidifier should be kept away from heat sources during operation to avoid overheating. The air inlet and outlet should be kept open and there should be enough space around. 2. During the operation of the dehumidifier, the hot air discharged from the air outlet is the normal operation of the machine. 3. Please use it in a sealed environment to avoid air flow decreased dehumidifying effect. At PICTEK, we offer not only high quality products, but also 12-month warranty and 30-day money back guaranty. HIGH MOISTURE REMOVAL: This home dehumidifier can remove up to 20 Ounces per day (It depends on your humidity environment) which keeps the environment in a suitable humidity and away from mold and moisture. 2 liter water tank let you free from drain the dehumidifier frequently. THERMOELECTRIC AND QUIET: Uses low noise thermoelectric peltier technology, which only makes lower than 35dB sounds. The sounds is so low that you can ignore it easily. Thermoelectric peltier technology provides low energy consumption and efficient dehumidification. AUTO SHUT OFF FUNCTION: Automatically shuts off and turns LED light red to mention you the water tank is full and it needs draining. Simply empty the water tank and place it back into the dehumidifier. Don't need to worry about spilling water and safety problems. ONE-BUTTON CONTROL: Without tedious steps, simple one-button control provides a hassle-free comfortable environment experience. 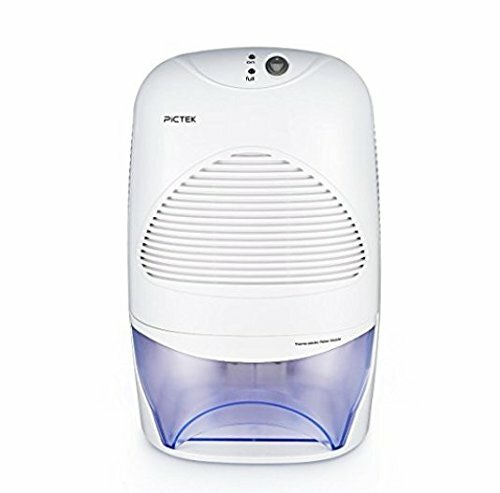 PORTABLE AND PRACTICAL: This dehumidifier can be moved easily and can work efficiently to remove moisture and fungi in small and middle size room, like kitchen, bathroom, bedroom, etc. It is more suitable for 1200 cubic feet space. AMRD-1459.125 * Davis Air-Dryr Marine Dehumidifier - 500 cubic ft.